Hey. Are you living in the middle of no-where? Have you got a choppy signal or, even worse, no signal at all? Vodafone want to talk to you. They’re looking for mobile “notspots” and are giving the opportunity for 100 rural communities to get piped up to proper mobile coverage. The network is spending more than £1 billion on improving their services and infrastructure, and they’re asking communities to work together to apply for the installation of the new “Open Sure Signal” tech. This will deliver 3G connectivity to areas that are sadly lacking in mobile signal. A trial on 12 rural communities has already proved successful in areas where planning permission and the geography of the area makes coverage tricky. The smaller Open Sure Signal masts are tiny compared to their normal mast-mounted counterparts, and help plug the mobile blackspots that many of us encounter in smaller villages and hamlets. These are basically larger versions of the standard Sure Signal device that we reviewed earlier. Here’s a video detailing the programme. If you want to get involved, get more detail here. Vodafone UK has launched a national programme giving up to 100 rural communities across the UK the opportunity to apply for mobile access. Vodafone is calling for communities to work together, in partnership with their local MP, to apply for the installation of Vodafone’s innovative Open Sure Signal technology in their villages and hamlets and bring Vodafone 3G mobile coverage to their area. In addition to Vodafone’s domestic Sure Signal device, up to one million people could have mobile signal in their community*. 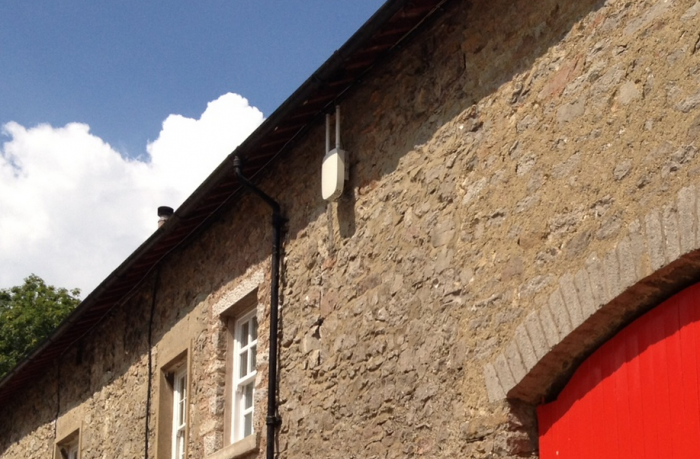 Vodafone’s initial Rural Open Sure Signal trial has seen the connection of 12 rural communities across the UK, from Walls in the Shetland Islands to Newton St Cyres in Devon. Communities connected so far have been enjoying social media using mobile internet whilst businesses, from GPs to a mussel farmer, now have mobile signal to help make their businesses work better. In rural and remote locations across the UK, networks can struggle to deliver coverage via traditional means. This may be due to the geography of the area or difficulties with planning permission in areas such as national parks and areas of outstanding natural beauty. Vodafone Open Sure Signal uses ‘femtocell’ technology to provide a Vodafone 3G signal in areas where traditional mobile coverage has been unable to reach. Mobile connectivity has been identified by many commentators as playing a vital role in keeping communities in touch and helping to support rural economies. The economics of getting mobile coverage into rural areas by traditional methods, however, can mean that some communities have less opportunity than others to benefits from mobile connectivity. Ofcom’s latest annual Communications Market Report highlights that half the UK population now use their mobile phone to access the internet. ** Vodafone Rural Open Sure Signal not only enables Vodafone 3G voice services, but also provides the community with much needed access to the internet via their mobile. About the size of a domestic broadband box and in a range of colours (white/grey/brown), the units use existing broadband services to deliver the Vodafone 3G mobile signal. The units can be installed on any number of buildings including village halls, pubs, shops and homes across the community to ensure widespread mobile coverage. As well as using Rural Open Sure Signal to plug 100 rural “not-spots”, Vodafone is spending more than £1 billion on its network and services across the country this year, including extending its 4G coverage to 259 cities and towns and thousands of smaller communities across the UK. That investment comes on top of the £802m that Vodafone spent acquiring the widest portfolio of mobile spectrum in last year’s auction of new capacity by Ofcom. Vodafone have pledged to provide coverage using 2G, 3G or 4G services to 98% of the UK population in the next few years. · Coverage predictions are based on a number of factors including that Vodafone can obtain planning permission to build sites, access to land or buildings to place equipment and backhaul to connect sites.